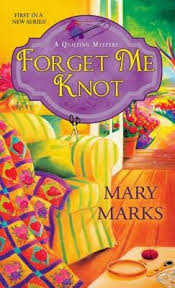 Forget Me Knot by Mary Marks is a January 2014 Kensington publication. I was provided a copy of this book from the publisher and Netgalley in exchange for an honest review. Fifty-five year old Martha Rose and fellow quilting club members are meeting a new member, Claire, at her home. Upon arrival however, they find Claire is dead. Something doesn't add up and before long it is determined that Claire was murdered. But, who would want Claire dead? When Claire's mother contacts Martha and ask her see if she can determine a message in the beautiful quilts Claire had made, Martha becomes a target herself. A quilting themed cozy mystery and the first in a new series was a solid start to what could be a long running series. The mystery surrounding Claire and her messages woven into her prize winning quilts, hits home for Martha in a very personal way as she decides that it is time to find out more about the father she never knew. There is also a little bit of an edge to this cozy by addressing certain hard to discuss issues. There was of course some really funny moments as well, and just little bit of romance. I really like the protagonist being a "mature" person and still having a nice and active life. Martha is still experiencing the pain of a lonely childhood where her mother was distant and her grandmother has to raise her. Martha also has a great crew of friends and they all rally around each other when a crisis arises, and they cheer each other on when they have a good thing going in their lives as well. Once this series gets going, I think the characters will come to life a little more and we will see the personalities become more solid and before long will be like old friends to us. I would recommend this one to all lovers of cozy mysteries, even if you are not a quilter or know anything about quilting. I don't quilt, but I found all the information about it very interesting.